Would You Want to Live in this Smart Meter Home? There is a saying that “a picture is worth a thousand words.” Utilities sometimes like to downplay concerns about wireless smart meters by explaining that the meters are normally mounted to the outside of the home and that most of the RF radiation emitted from the meter should be directed away from the home. 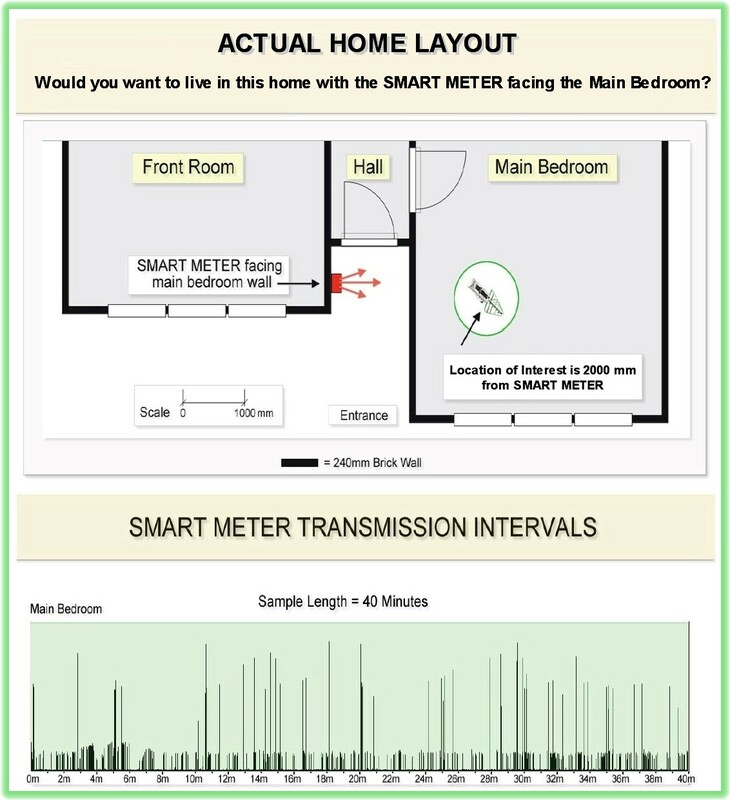 Without taking the time to dispute the relevance of that possible assertion at this juncture, what about the “real life” situation pictured below where the smart meter is not directed “away” from the home? Should a smart meter be mandated for this home? Would you want to sleep in the bedroom pictured below? Would you want your young children to sleep in the room labeled as the Main Bedroom? The above graph shows actual transmission pulses from the smart meter as detected in the bedroom at a distance of 2 meters (and penetrating the house wall). Through personal communications, I have been assured that no Wi-Fi, cordless phones, etc., were in the immediate vicinity of the home while the monitoring was performed. Rather than presenting the specific power density measurements taken for this home, which I did not perform, I would like to present the results of a simple calculation that should be valid for any home, using typical smart meter specifications and using the equation shown in the figure. If you assume a power output, P, for the smart meter of one (1) watt and an antenna gain g of 2.5, the expected power density PD at two (2) meters would be 50,000 microwatts per square meter. If one then also assumes that the bedroom wall would attenuate the readings by a factor of 10, the expected RF exposure levels in the Main Bedroom at two (2) meters from the smart meter could be reduced to about 5,000 microwatts per square meter (assuming that RF wave reflection does not play a significant role). Thus, even with the “shielding” offered by the Main Bedroom outer wall, anticipated exposure values would still exceed the action levels recommended in the BioInitiative Report 2012 as well as the older and less restrictive BioInitiative Report from 2007. No doubt the utility company response to any concerns voiced by the homeowner for a smart meter and home configuration shown similar to above would be to suggest that the homeowner move the service line to another location at his or her own expense (which would normally cost several thousands of dollars). Would that type of response from a utility company seem fair? Finally, just to summarize the main message for this website posting, … would you want to live in the home pictured above with a mandated wireless smart meter? This entry was posted in Smart Grid, Smart Meters, and RF Emissions and tagged Health Effects, RF Emissions, Smart Meters. Bookmark the permalink. 4 Responses to Would You Want to Live in this Smart Meter Home? I live in a smart meter home and absolutely HATE IT! Ever since my Energy Provider affixed the [meter] to my home, without my consent, I have experienced deteriorating health. An example of the side effects I have endured are: insomnia, heart palpitations, frequent urination, splitting migraine headaches, depression, exhaustion and now, more serious heart problems. Even my children are complaining about having shooting head pains throughout the day! I am furious at the fact that our government has allowed these high-tech meters to be installed on our homes and businesses. They are extremely dangerous and yet there are NO (UL) Tested and approved stickers on ANY of the smart meters. In my opinion, there is NO DIFFERENCE, between having smart meters placed on one’s home or business and /or someone holding a loaded pistol aimed at one’s head. These things are dangerous and should NEVER have been allowed to be placed on our homes… Not only are these machines a serious public health hazard, but they are an unfathomable threat to the individual Freedom of every citizen around the world! Just imagine what will become of us when all our available energy is left in the hands of a few … NO ONE should be allowed to have this much control over the world… The smart Grid is BAD NEWS!!! These meters will control our: electricity, water and gas usage. Wake Up, America!!! This website posting was written to provide a clear and simple example of why mandated smart meters are not reasonable. You are highlighting another example which involves multi-family housing where banks of smart meters can present an elevated risk as well. Also, in this instance, even if you personally have an opt-out option, you cannot control all the meters in your building, or in the next building over, etc. It is frustrating for me to not be able to help you more other than suggesting that you keep your bed as far away as possible from that outer wall where the smart meters are on the other side. My primary way to put things in perspective at this point is to say that we need to be concerned with all RF emission sources, not just the smart meters. Maybe check out another posting of mine for general RF safety recommendations: http://thetruthaboutsmartgrids.org/2013/09/01/health-panel-highlights/. Although the posting itself highlights risks for children, the safety recommendations are valid for everyone. Of course, the ultimate safety recommendation would be to move to a new home, but possibly you could first find someone to monitor your home environment to confirm if your current protective measures are effective.